The Whitney Museum of American Art in New York is hosting the biggest Warhol retrospective in almost 30 years. Andy Warhol is about to get another 15 minutes of fame. 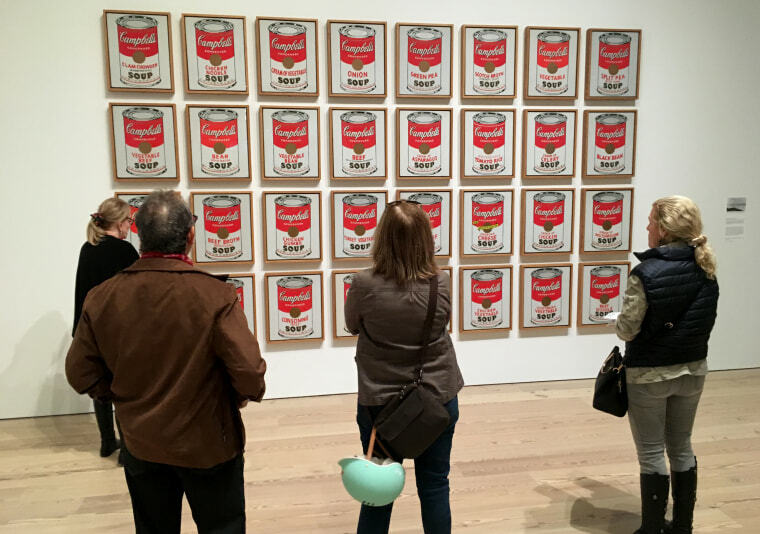 A retrospective of the artist, whose pop-art classics include Campbell's Soup can paintings and Brillo box and Marilyn Monroe silkscreens, is opening Monday at the Whitney Museum of American Art in New York — the largest show of Warhol's work in nearly 30 years. "Andy Warhol From A to B and Back Again" showcases his prolific journey bringing together 360 works that represent an era in art history and still resonate decades later. "There is something in his work that speaks to our contemporary culture," said Donna DeSalvo, the Whitney's deputy director and senior curator, who met the artist in 1986. "There is punch in Warhol's work, there's mystery and it’s not easy to know what’s going on." New York Times culture reporter Robin Pogrebin said the Whitney show, the biggest Warhol retrospective since the Museum of Modern Art's famed 1989 exhibition, gives a good look at just how much the artist changed his field. "Warhol upended traditional definitions of what constitutes art, incorporating his early professional experience with commercial design, changing the way we look at everyday items like a soup can or a soap box, brazenly embracing celebrity and incorporating political issues like AIDS and capital punishment," she told NBC News by email. Pogrebin added that the new exhibit also gives a rare "window into his early years, when he was just beginning to experiment with his form." Warhol started his career as a commercial illustrator, and his early works experimenting with stamps and stenciling are on display. He used those techniques to make art before he hit on subject matter that has mass appeal. Warhol, who died in 1987 at 58, became a successful and highly paid commercial illustrator in New York before he began to make art destined for galleries. He built a lucrative career and his clients included companies ranging from CBS and NBC to Ciba Pharmaceuticals and Martini and Rossi. His work at his New York City studio, The Factory, was groundbreaking. Warhol was reinventing how we think about painting by using the silkscreen as a brush in his depictions of Marilyn Monroe, Marlon Brando and Elvis Presley. "Modern art, as he defined it, meant everything was fair game as subject matter — from celebrities to soup cans to electric chairs," said Pogrebin. Museumgoer Leslie Davies said: "He was original. He took mundane everyday things and brought them to a new level, things that are in your pantry all of the sudden they are on your walls." Warhol also made more than 650 films, including hundreds of silent screen tests. The short films and screen tests on display at the Whitney are fascinating to watch as his friends, including his muse Edie Sedgwick, pose and dance and make faces for the camera. His career spanned four decades, his oeuvre is vast and this show delivers with works covering his entire career. He produced thousands of commercial illustrations, paintings, drawings, prints, photographs, sculptures, magazines, films, videos and so much more. The treasure trove ends with his "Rorschach" images, a giant Mao painting, his collaboration with Jean-Michel Basquiat, and the 35-foot "Camouflage, 1986." "It's too much to absorb right now," said visitor Eileen Rhulen, who has a Warhol of her own at home. "He was an amazing character, how he did what he did with such thought, but it looks so simple." The show will run through March, before moving to San Francisco and Chicago.